"Arriving for a tree burial by canoe, in British Columbia, a traditional Indian ceremony", c. 1920. Watercolour by Joanna Simpson Wilson. One of the most distinctive burial methods on the Northwest Coast was the creation of platforms in trees, on which coffins would be placed. While the practice is commonly recorded and discussed in the Anthropological literature, photographs of tree “burials” are rare — and even if they were not, then reproduction of these images might well be problematic. I recently ran across the image above by the little-known Canadian author Joanna Simpson Wilson (1896-1987), which shows numerous bentwood boxes attached to trees as a throng of mourners gathers below. The platforms are rather insubstantial and the coffins are stacked several-high in places, with red cloth attached — perhaps the remains of blankets. After a number of years, the boxes would deteriorate and the remains of the body would fall from the tree. At this time, a secondary burial at a village site cemetery or other place might be performed. I have seen the remains of several tree burials in the field, with human remains scattered beneath the branches of a large spruce — looking up, there are large branches with ring-like pathologies where the bark grew around rope, and other evidence of cultural modification. 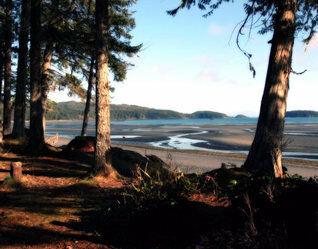 Archaeologically, there is a trend over the long term along the coast for inhumation of human remains to give way to sky burials or mortuary houses. 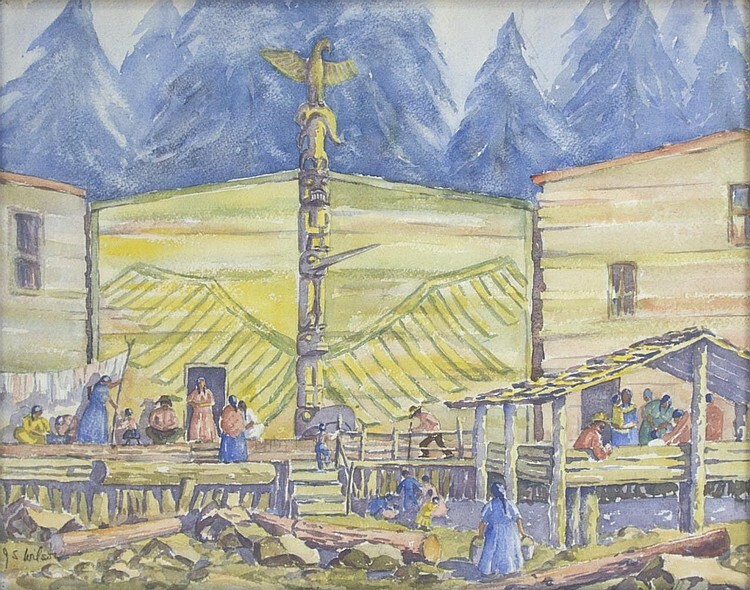 According to this site, the setting of the painting is the Kwakwaka’wakw village of Tsaxis (near Fort Rupert / Port Hardy on Vancouver Island), specifically a place called Storey Beach (more pics). 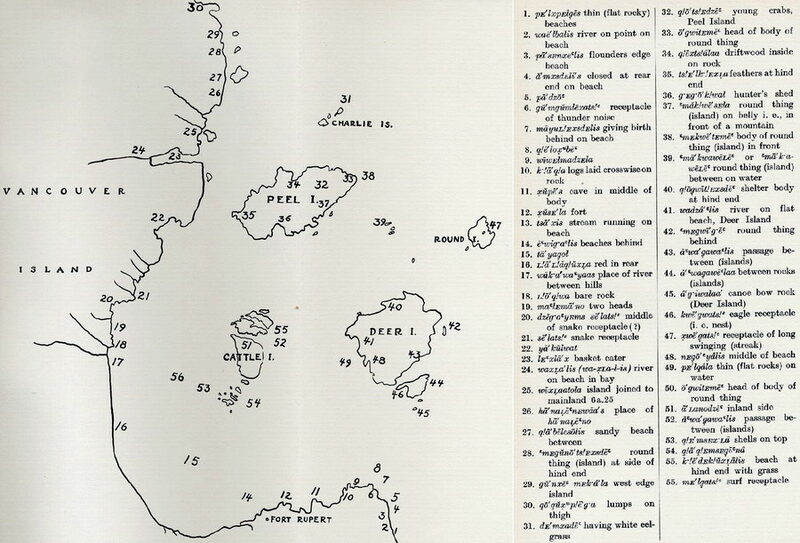 Boas 1934: Geographical Names of the Kwakiutl Indians. Click to enlarge. Strangely, Tsaxis (#13) is not plotted on the map. 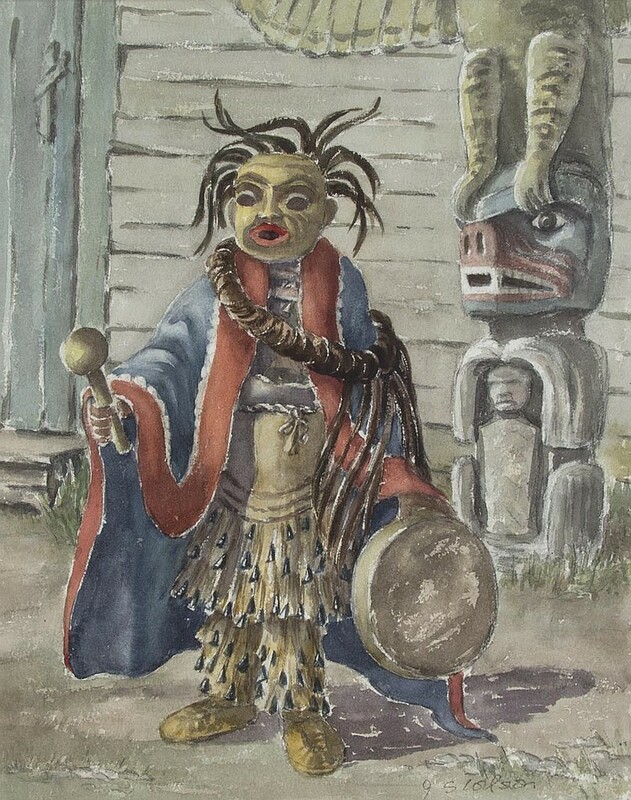 This entry was posted in anthropology, Archaeology, First Nations, Northwest Coast, Vancouver Island and tagged Archaeology, burials, Joanne Simpson Wilson, Kwakwaka'wakw, painting, tree burials. Bookmark the permalink. I noticed that two more of Joanna Simpson Wilson’s paintings are up for auction in a couple of days. I presume they’re approximately the same vintage, namely, 1920s? At estimate of around 1,000$, they’re cheaper than the dross which adorns most of the intricate network of cafes disguised as Blog Media Tower One. Photos of these are rare, as you say. One well known one is from the Curtis volume – has its flaws for staged photos but this one is pretty much a straight landscape documentation.